The internal components of modern anesthesia machines capture and hold volatile anesthetics which are released when the machine is used for a new patient. Even trace amounts of vapor can be harmful for susceptible patients. Previously, flushing the anesthesia machine with high fresh gas flow for an extended time before a case was thought to help decrease the risk to susceptible patients. 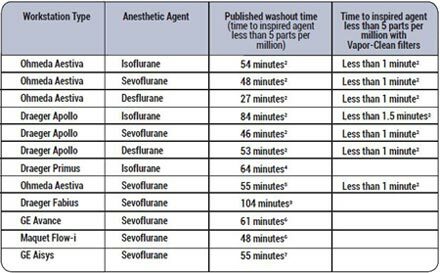 Now, in less than 90 seconds, Vapor-Clean activated charcoal filters reduce exposure to less than 5ppm of desflurane, sevoflurane and isoflurane molecules from reaching the patient for an entire case lasting up to 12 hours. The table is a summary of published studies that show the extended periods of flushing needed without the Vapor-Clean filters before modern anesthesia delivery systems can be used for MH-susceptible patients. The data plot at right shows concentration of anesthetic vapor in an Ohmeda Aestiva anesthesia machine after the machine was used to deliver isoflurane at 1 MAC for 2 hours. 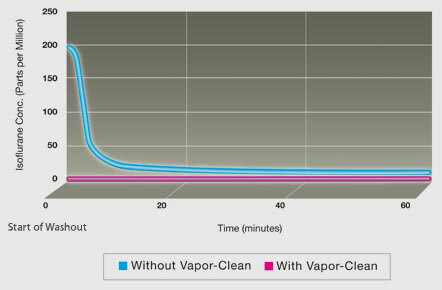 Without the Vapor-Clean, it took over 60 minutes of flushing the machine at 10 L/minute before the vapor emitted by the machine was safely below 5 parts per million. 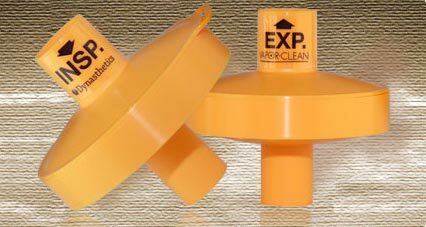 Under the same conditions, when using the Vapor-Clean filters, the machine was ready in less than 2 minutes. Patients are not exposed to a rebound effect as the Vapor-Clean filters block vapors for the entire case. In the event of an MH crisis, physicans can quickly turn off the anesthetic gas, place the Vapor-Clean and curtail further exposure without delaying the administration of dantrolene, and without switching to manual ventilation. Without the Vapor-Clean, the time needed to replace the anesthesia machine, or change the circle system and CO2 absorbant can often delay the administration of dantrolene.